Japanese soba noodles require a highly skilled hand; the chef must even take into account factors like humidity and room temperature before preparing the buckwheat flour dough and hand-cutting the noodles. Soba noodle chef Shuichi Kotani, Founder & CEO of Worldwide-Soba, Inc., takes pride in making artisanal fresh soba from scratch. 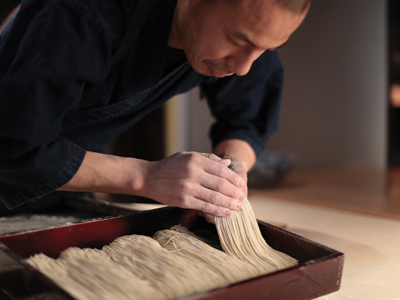 At this talk, Kotani divulges his secrets for making authentic soba, gives tips on how to best enjoy this nutrient-dense noodle and gives an on-stage noodle-making demonstration.